Icelandic scallop Chlamys islandica. When different animals exhibit a common pattern of abnormal closings (or openings), it means there is a common external stress (that can be pollution). Otherwise, each individual in the group, except for biological rhythms, lives its life independent from one another. Our system worked alone during 1343 days at sea. We had only 2 gaps in the record. In 2013, 8th April, the spot stopped sending datas and recordings during a full month. The most likely explanation was a problem of power. In 2015, we had another arrest, at the same period, from April 21 to June 13. Today we know that they had big internet problems. The HFNI valvometer started to emit its data on May 20th, 2012. A Norwegian mission dismantled the system in January 2016 on the occasion of a scientific trip in the Polar night. This is the very first time that one study online the behavior of marine animals at this latitude during such a long period, including 3 polar nights. 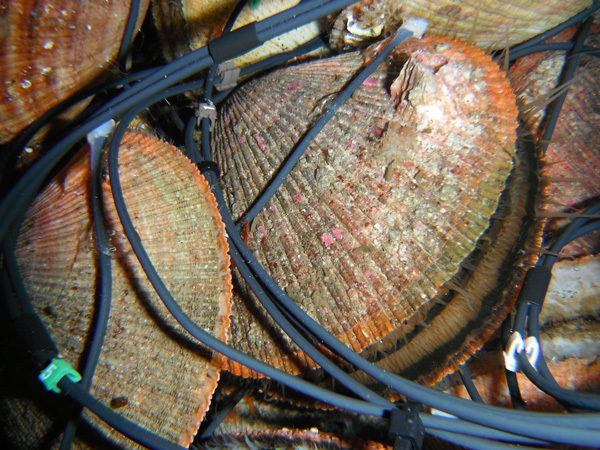 We are mainly interested by the daily behavior and the biological rhythms of the scallops we studied (daily, seasonal, annual). We are also looking for reference records in the global warming context and the future opening to industrial activities. This is one of the most extreme site we are studying right now (“extreme” means there: cold, night, icebergs, seal, walruse, polar bear and… unfortunate colleagues…).
. Ny Alesund, 79°N . 22/1/2016: 3 years & 9 months at sea!! !